Even some of the most environmentally conscious people find it hard to give up drinking flavored bottled water. And even for them lies a solution in water filtration. You’ve heard us say over and over that bottled water is expensive and bad for the environment. Bottled water advocates argue that their product provides a healthier option than sodas or other sugary beverages, and a ban on the bottle would only force people to turn to such less-healthy alternatives. Moreover, many people can’t live without their daily dose of flavored water, which, up until recently, only came in a bottle. But with PUR flavor options, consumers are left with no more excuses to drink bottled water, flavored or not. We recently added the PUR line of faucet filters and water pitcher filters to our website. (Actually, I must confess, they have been on the site for a few months now, so this announcement is a little late… but, better late than never, right?) The PUR flavored water pitcher filter and the PUR faucet mount filter with flavor options both reduce or remove harmful impurities and contaminants such as lead, mercury, cadmium, copper and microbiological cysts, in addition to the bad taste and odor of chlorine. How do you get flavored water from these filters? Very simply. Specially-made flavor cartridges allow you the option of adding a burst of strawberry, lemon, grape or raspberry flavor to each glass of purified water with the push of a button. The more you push, the more flavor is added. 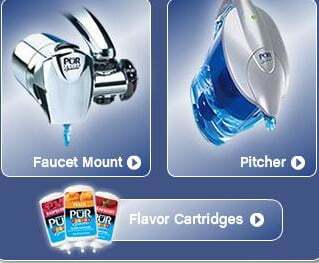 Each PUR flavor cartridge provides up to 75 servings of flavored water and contains no sugar, calories or dyes. The cartridges fit easily into the lid of the PUR water filter pitcher or into the front of the PUR flavor options faucet mount. Pure, filtered water is the healthiest way to go. However, if you must drink flavored water, you can do your part to conserve the health of our planet by dropping the bottle in favor of a PUR filter with flavor options.